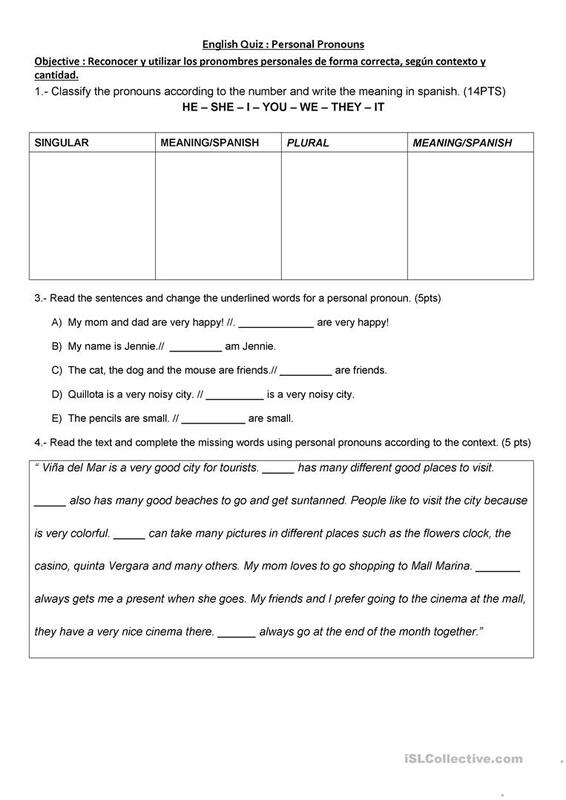 This is a very easy, friendly quiz or worksheet for elementary students who are just starting in the usage of english and they need to reinforce the use of personal pronouns. Hope you like it! The present downloadable teaching material is a great resource for elementary school students, adults and students with special educational needs, learning difficulties, e.g. dyslexia at Beginner (pre-A1) and Elementary (A1) level. It is valuable for teaching Personal pronouns in English, and is a valuable material for strengthening your groups' Writing skills. It is about the vocabulary topic of People. TiaMissConi is from/lives in Chile and has been a member of iSLCollective since 2016-09-12 11:09:30. TiaMissConi last logged in on 2019-04-18 21:01:05, and has shared 2 resources on iSLCollective so far.